7/26: Beautiful, spacious master bedroom on 1st floor with en-suite bath and kind bed. 10/26: Beautiful, spacious master bedroom on 1st floor with en-suite bath and kind bed. 12/26: Addition 2nd floor living area Wall mounted smart TV, new sleeper sofa. 17/26: 3rd king bedroom - 2nd floor w/ private bath, flat-screen TV. An ideal home for 2-3 families with children, or groups of 10 adults max. “So Stinkin’ Cute” is next door to our “Too Stinkin' Cute” house – so if you have a larger group, you might consider renting two properties close to each other! We recently completed a total remodel of this home, and the new name speaks for itself…it really is “So Stinkin’ Cute,” you won’t want to leave! The fresh, bright paint and new furnishings and decor will welcome you to the beach in style. We’re serious about offering the best homes in the neighborhood, and the best possible service for our guests. You’ll appreciate the casual comfort and beachy style of the new living room furniture, new beds (3 Kings and 2 full-over-full bunks), new quilts and upgraded Egyptian cotton sheets. The kitchen is also newly equipped with plenty of dishes, Professional Calphalon Cookware, a Keurig D-Cup coffee maker, and everything you’ll need to relax and truly enjoy your vacation. With 4 Bedrooms and 3-1/2 Bathrooms, So Stinkin’ Cute will be a perfect home for your family or group vacation. There is room for everyone in the spacious floor plan, with accommodations for 6 adults in King Beds and up to 8 small children in bunks. There is also a sleeper sofa on the second floor. We keep all our homes clean and well updated and pay attention to amenities you expect, such as high-speed internet, nice flat-screen TVs, high-definition cable, hair dryers in each bathroom and more. We also provide items our smaller guests may need like a high chair and pack-n-play. Beautiful wood floors welcome you into the main floor of this home with a spacious open living and dining area. You can sink into the brand new linen sectional and enjoy the flat screen TV, or gather in the roomy dining area for games and meals. The large table seats 6, and there’s room for 3 more at the counter. You’ll enjoy preparing your favorite foods in the gourmet kitchen with Granite countertops, a large pantry, and stainless steel appliances. On the main level, you will find a spacious bedroom with a King bed with a brand new quilt and 100% Egyptian cotton sheets. There is a flat screen TV and plenty of storage in the bedroom, and a walk-in closet in the attached bathroom. Bedside tables and lamps are on each side of the bed, and the windows have blinds and curtains so you can enjoy an afternoon nap or sleeping in while on vacation. En-suite to King Master on the main level, this beautiful bathroom features a commode, shower and large vanity with double sinks. There’s a relaxing soaking tub, large, fluffy bath towels and a personal hair dryer. Also on the first floor, you’ll find a convenient half-bath with pedestal sink and commode. Upstairs you’ll find a second King Master Bedroom, which features a BRAND NEW King bed, with a beautiful new quilt, super soft 100% Egyptian cotton sheets and new pillows. This room offers lots of storage, a roomy closet, and a flat-screen TV. There are two bedside tables with lamps for reading and a private attached bath. En-suite to King Master #2, this convenient bathroom includes a vanity with sink, commode, and shower. Also included are big fluffy bath towels and a personal hair dryer. 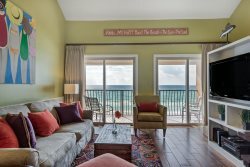 There is another King Master on the second level, which has a BRAND NEW King bed with a one-of-a-kind headboard built by a local Destin craftsman. You will rest comfortably in super soft, 100% Egyptian cotton sheets and new pillows and quilt. There’s also a large dresser, a flat screen TV, a bedside table and lamp and a large closet in this room, as well as private access to the front deck. The children will love having their own space in this great room with two sets of BRAND NEW full-over-full bunk beds (yes! that's 4 full-size beds) and a flat-screen TV. There are a large dresser and closet for plenty of storage and an adorable fish wall hanging designed by a local Destin artist. This well-appointed hall bath boasts a large vanity, commode and tub/shower combination, as well as a personal hair dryer and big, fluffy bath towels. Also on the 2nd level, is a 2ND LIVING AREA with a brand new, linen sleeper sofa, an oversized chair and ottoman, and a wall-mounted Smart TV. You can access the large, comfortable front deck from this area. It's a great place for the children (or adults) to hang out! 2nd Floor Laundry – Talk about convenient! There’s a stackable washer & dryer in the hallway upstairs, just where you need it. BEACH and POOL – This home in the Villages of Crystal Beach offers the best of both! You’ll enjoy resort-style amenities including a lagoon style pool with 30,000 square feet of gorgeous, sparkling clean water, with a walk-in area, three waterfalls, spa, and lavish landscaping. There are plenty of seating areas for your group to enjoy. When you’re ready to feel the sand between your toes, walk the short 3-4 blocks to the beach, or hop on the free, seasonal trolley, running from Spring Break to Labor Day. Crystal Beach is a charming seaside community located across from the Bass Pro Shop on the East side of the city of Destin. It's a terrific residential area, yet close to restaurants and activities. Walk to Twirls Frozen Yogurt, O'Quigley's Seafood Steamer, Marble Slab Creamery, Subway, Cracker Barrel, Chili's, Olive Garden, Outback Steakhouse, and a lot more. Destin Commons, a beautiful upscale shopping and entertainment center, is right across Hwy 98. It features over 75 shops and restaurants, including World of Beer, Panera Bread, Uncle Buck's Fish Bowl & Grill, AMC Theater with IMAX and much more. Nearby are 6 miles of paved trails - perfect for walking or biking. So Stinkin’ Cute has parking enough for two cars in the driveway, as well as an additional overflow parking lot. You and your group will have an unforgettable vacation here. No one has standards as high as ours, and no one delivers on their standards as we do. You’ll find our homes furnished nicer and better equipped than most, and impeccably maintained. We’re here if you should need us during your stay. WE’RE ALSO PET-FRIENDLY. Call to book now. A well planned, private community with an incredible, huge, sprawling public pool with waterfalls. Free tram service to the beach from spring break through September.